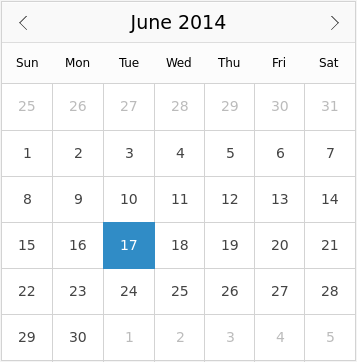 Calendar allows selection of dates from a grid of days, similar to QCalendarWidget. The dates on the calendar can be selected with the mouse, or navigated with the keyboard. The selected date can be set through selectedDate. A minimum and maximum date can be set through minimumDate and maximumDate. The earliest minimum date that can be set is 1 January, 1 AD. The latest maximum date that can be set is 25 October, 275759 AD. The selected date is displayed using the format in the application's default locale. Week numbers can be displayed by setting the weekNumbersVisible property to true. You can create a custom appearance for Calendar by assigning a CalendarStyle. The format in which the days of the week (in the header) are displayed. Locale.ShortFormat is the default and recommended format, as Locale.NarrowFormat may not be fully supported by each locale (see Locale String Format Types) and Locale.LongFormat may not fit within the header cells. This property determines the visibility of the frame surrounding the calendar. This property controls the locale that this calendar uses to display itself. The locale affects how dates and day names are localized, as well as which day is considered the first in a week. The default value is equivalent to Qt.locale(). This property was introduced in QtQuick.Controls 1.6. The latest date that this calendar will accept. By default, this property is set to the latest maximum date (25 October, 275759 AD). The earliest date that this calendar will accept. By default, this property is set to the earliest minimum date (1 January, 1 AD). This property determines the visibility of the navigation bar. This property was introduced in QtQuick.Controls 1.3. The date that has been selected by the user. If selectedDate is outside the range of minimumDate and maximumDate, it will be clamped to be within that range. selectedDate will not be changed if undefined or some other invalid value is assigned. If there are hours, minutes, seconds or milliseconds set, they will be removed. This property determines which month in visibleYear is shown on the calendar. This property determines which year is shown on the calendar. This property determines the visibility of week numbers. Emitted when the mouse is clicked on a valid date in the calendar. date is the date that the mouse was clicked on. Emitted when the mouse is double-clicked on a valid date in the calendar. date is the date that the mouse was double-clicked on. Emitted when the mouse hovers over a valid date in the calendar. date is the date that was hovered over. The corresponding handler is onHovered. Emitted when the mouse is pressed and held on a valid date in the calendar. date is the date that the mouse was pressed on. Emitted when the mouse is pressed on a valid date in the calendar. This is also emitted when dragging the mouse to another date while it is pressed. Emitted when the mouse is released over a valid date in the calendar. date is the date that the mouse was released over. Sets visibleMonth to the next month. Sets visibleYear to the next year. Sets visibleMonth to the previous month. Sets visibleYear to the previous year.